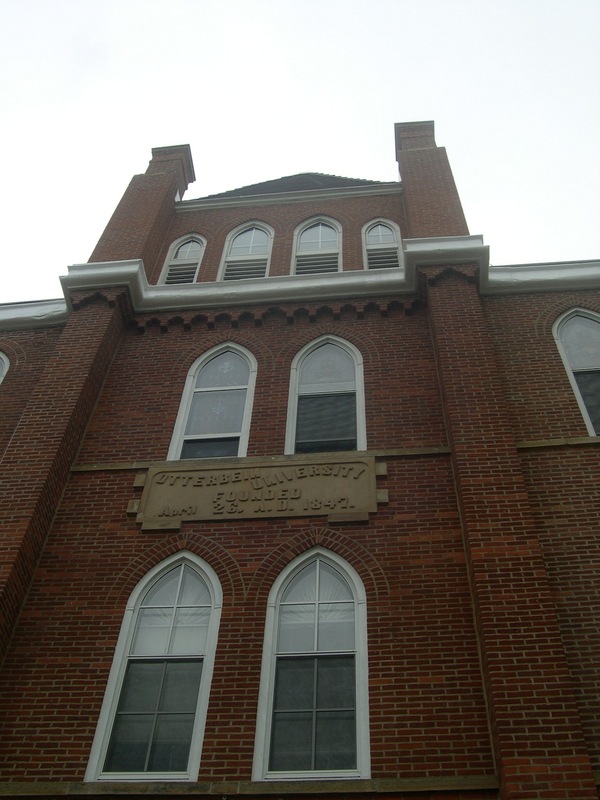 The students who attend SMWC love it here… but it is a self-selecting sort of place. “People who come here pretty much know what they’re in for,” said the tour guide. 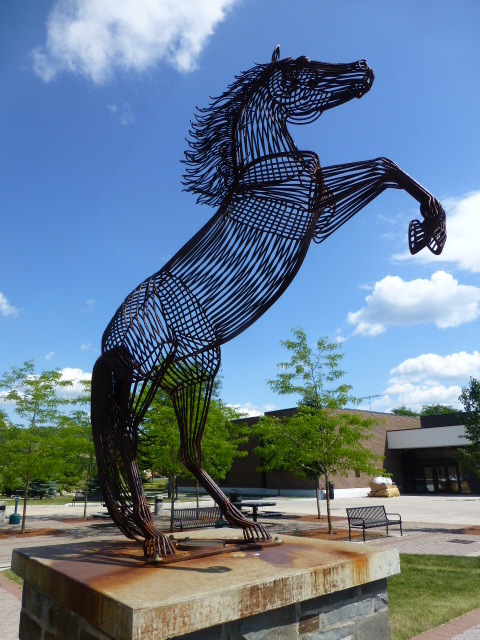 For the student who is looking for small and Catholic – and possibly an equestrian program – this is the school. 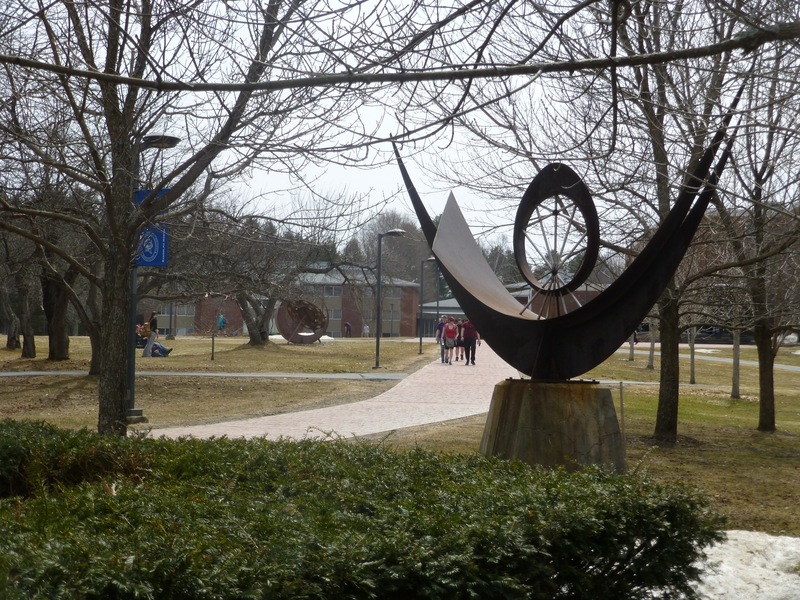 Most of campus is pretty with attractive buildings and amazing landscaping (making parts feel very wooded – go figure! ); however parts of it raise eyebrows such as the weeds on the tennis courts. “You can tell we don’t have a team,” said the tour guide. Some of the statues around campus. This liberal arts college sits 10 minutes outside of Terra Haute which is very much a college town (Indiana State and Rose-Hulman are both here). “We’re trying hard to keep kids here on the weekends. We have a great student-life staff,” said an admissions rep. There are things to do, but it’s not a bustling campus, and nothing is walkable from campus. “I would rank the craziness factor at about a 3,” said the tour guide. “There’s definitely a social life and I’ve made lots of friends, but events end early. But that means that I can also get my work done. It’s kind of the best of both worlds.” Anyone can have cars and there are currently no shuttles offered to students to help get around town. It’s also a dry campus. One of the dorm rooms; many are suite-style and some even have balconies! SMWC is growing with the largest incoming class to date entering this fall. This is also their 3rd year of being coed. “In real numbers, that’s about 40 guys out of about 380-400,” said the rep. They’re actively trying to change perceptions about the school (particularly in terms of them accepting men), and they’ve added golf last year with Cross Country and Equestrian (Western Hunt Seat) starting this fall (2017). In 2018, they’ll add soccer. Our tour guide didn’t pick the college because it was all-female, “but I ended up loving it!” However, she thinks that going coed is also a positive change for the school. Campus is very clearly Catholic, although mass is never required and the only religious requirement is 1 philosophy or religion class. There are statues (including a walkway with the Stations of the Cross), a large chapel, a small chapel, a churchyard where many of the nuns are buried, a grotto, etc around campus. 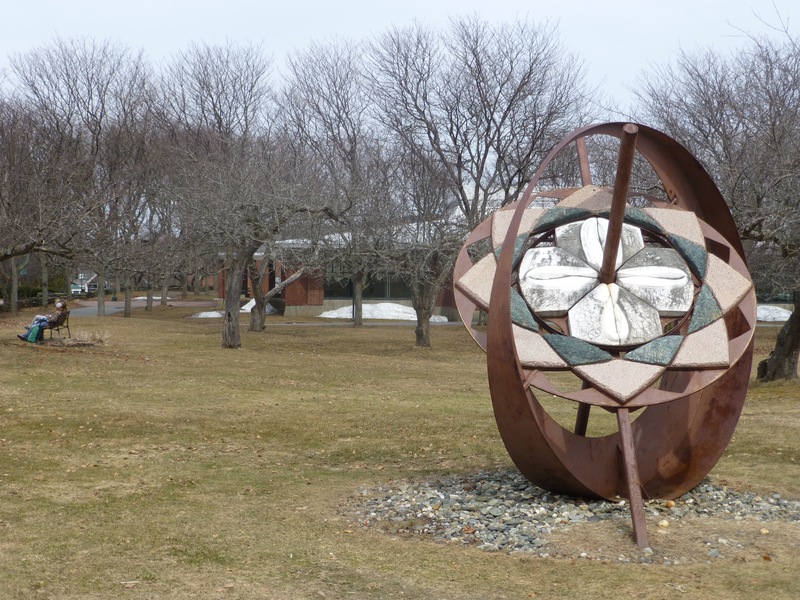 Campus was founded by the Sisters of Providence from France, and many still live on campus, “but it’s like a retirement home. They don’t teach, but will sometimes come in to do guest lectures on campus,” said the tour guide. This order is very liberal, and they’re often seen protesting the death penalty and other social justice issues. The nuns run an alpaca farm and use the wool in fair-trade goods. Students and community members can take spinning classes. Classes average 11 students with an option for online classes for undergraduates. Their strongest program might revolve around the extensive equestrian center. They offer Equine Studies, Equine Training and Instruction, and Equine Business Management as majors with Equine Assisted Therapy and Equine Science as minors. Students in the equestrian programs/majors are assigned a horse which they must take care of as part of their grade. The school also gets a number of yearlings that students train as part of a class. Other notable programs include Music Therapy, Professional Writing, Human Resource Management, 3+1 Leadership Development program (pairing any major with a Masters in LD), Healthcare Administration, and Nursing. Music is coming back; it had been gone for awhile because of budget cuts. In addition to regular merit scholarships, they offer a competitive, full-tuition scholarship. Students write essays for the first round; from these, admissions will select students to interview; 4 get the scholarship. Although this school sort of has the reputation as a “forgotten step-sibling” of the SUNY system, this is rapidly changing. The buildings are being renovated and new buildings are going up around the beautifully landscaped campus. This is a perfect school for students who are more of the hands-on types of learners; in fact, it ranks in the top 10 in the country for students who do internships. Classes are small, even for first-year students. “40 students would be a big class,” said the tour guide. Her largest class had 28 students; the smallest had 8. 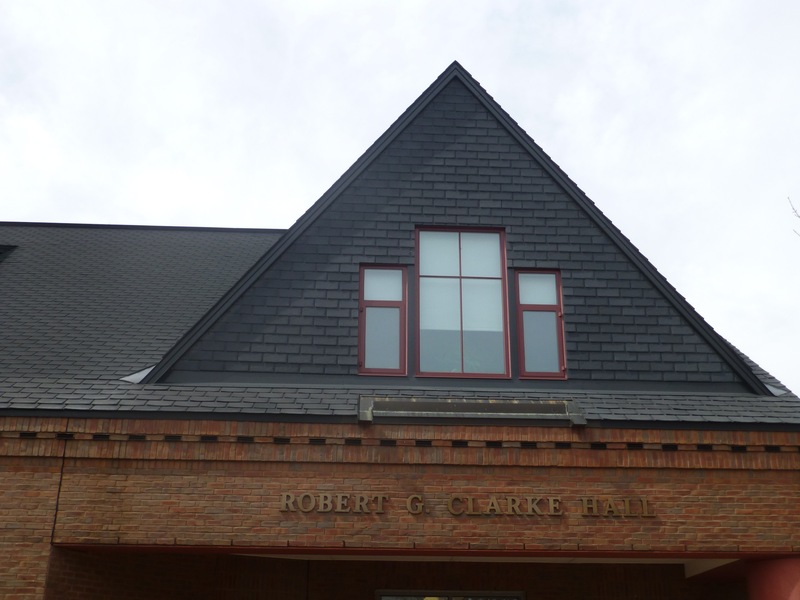 Morrisville is the first SUNY school to provide laptops to all its students back in 1998, and many of its programs require one as part of the curriculum. Majors include such areas as Applied Psychology, Renewable Energy Technology, Resort and Recreation Management, Journalism and Communication for Online Media, Dairy Tech, Automotive Management and/or Auto Tech, Equine Science, and several Info Tech specializations (Network Admin, Web Development, End-User Support, Electronic Marketing, Application Software Development). Design and architecture (including landscape architecture) has its own building, as does Auto Tech. 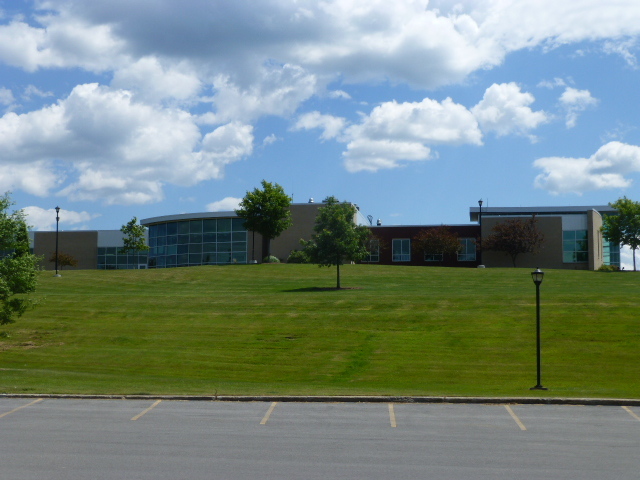 That large structure with 12 auto bays sits on top of the hill overlooking much of campus. The Equine Center, which opened in 2011, is about 3 miles from the main campus and can house 40 horses. There’s a lot to do on campus. Movies are shown three times every weekend, there are plenty of clubs (the more unusual ones are the Casino Management Organization and the Pagan Alliance), and trips are offered most weekends. If 10 or more students want to go somewhere, they can request a van. Sports are popular (they’re DIII); they offer the usual sports plus Hunt Seat and Western Equestrian in the winter. They have an Ice Plex on campus with 2 full rinks. Their women’s hockey team is new this year. There are plenty of open skate times and students can use skates for free. Students do not automatically pay the $65 fee for the Fitness Center (located in the student center); they’re welcome to join if they want to use it. This is a nice change from so many schools that charge it regardless of interest. 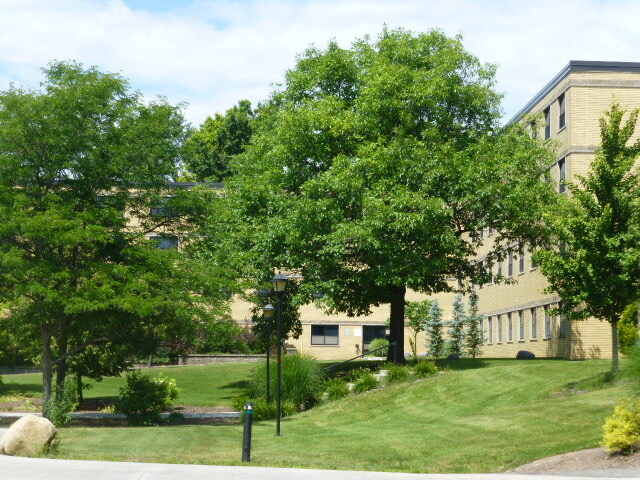 Approximately 1800 students (of the 3200 undergrads) live on campus. Housing is grouped into 3 areas: Pond Quad, Iroquois Quad, and the Commons. Each dorm and area has its own “personality” or attraction. The Commons offer apartment style living and are some of the newest buildings. Fountain View Hall (in Pond Quad) is the 24-hour quiet dorm. Mohawk just got renovated and now has a full kitchen in it. Two more dorms are about to be renovated as well. Most dorms have suites (2 bedrooms and a main room), singles, and doubles. “Parking can be tricky since so many students commute,” said the tour guide, but all students can have cars, and their cars can be fixed for free by the auto tech students. They just pay for parts. Another cool fact: all the milk served on campus comes from the campus dairy, and much of the produce is grown by the aquaculture students. “Breakfast is amazing!” There’s a make-your-own-waffle station with batters like apple cinnamon or blueberry. Omelets are great, too. The main campus houses about 950 students with another 700 more using the satellite campuses around the state. Only about 500 students live on campus in one of the 4 residence halls. Some degrees are only located on particular campuses, such as the Aviation Degree at Williston because of the proximity to Burlington airport (students in this program can graduate with their pilot license). Other campuses are primarily nursing and some respiratory majors. Architectural Engineering is math and science based. A Farm is attached to campus. The equine and agricultural majors have chores. There’s not a lot going on around campus. Our tour guide said that weekends can be slow and that a lot of people leave, but they’re working on providing more to do so people stick around. Karaoke drew a big crowed. A couple big events on campus include Spring Bash (with fireworks, dunk tank, slip and slide, and more) and Country Dance (complete with a mechanical bull), and trips to Boston. Basketball (their teams are DII) draws a big fan base, but “soccer, not so much.” They have a small ski slope with a tow-rope on campus, and students built a heated ski hut at the bottom. They have rolling admissions except for nursing, dental tech, and vet tech which all have a 12/1 deadline because of limited spots in the programs. Admissions are looking for “good solid students who know what they want to do. One of my former students had gone to Otterbein and had a great experience, so I was particularly excited about getting to see her alma mater. As a particularly big fan of small liberal arts schools, I was hoping for great things. I knew very little about the school other than they were on the quarter system, the student had good things to say about it, and a few things that I had read on the website (and let’s face it – one website starts looking a lot like every other website after a while). The bus pulled up to the Equestrian Center for the first part of our tour; this was a good move on their part since it highlighted a unique program at the very beginning. The Center was extensive and new; after being able to meet the representatives for our regions and a brief welcome from the President of the college (and being able to help ourselves to some very tasty cookies! ), we got a tour of the riding rink and the barns where we also got to play with some of the horses, many of which looked expectantly for peppermints, the new treat of choice. Students in the Equine Studies program have priority for space in the barn for their horses, but other students can board horses as space allows. The university also owns many of the horses, most of which were donated from a variety of sources – rescues, ex-race horses, etc. Equine Science is a selective program; this year, they had about 70 applications for 22 new spots. Theater is the most selective program on campus, accepting 16 students out of the approximately 400 who apply for the BFA in acting. We talked to several students who had auditioned for a spot in the acting program but didn’t make it; however, they liked OU so much that they came anyway and are majoring in another area of theater such as Design & Technology, Musical Theater, and Theater Management, or they’ve gone into communications, another very strong program with concentrations in areas such as broadcasting and journalism. Business is the largest major; popular concentrations include accounting, economics, finance, human resource management, and international business. Education and Nursing are both strong, popular programs, and students have high levels of success on the respective Board exams. 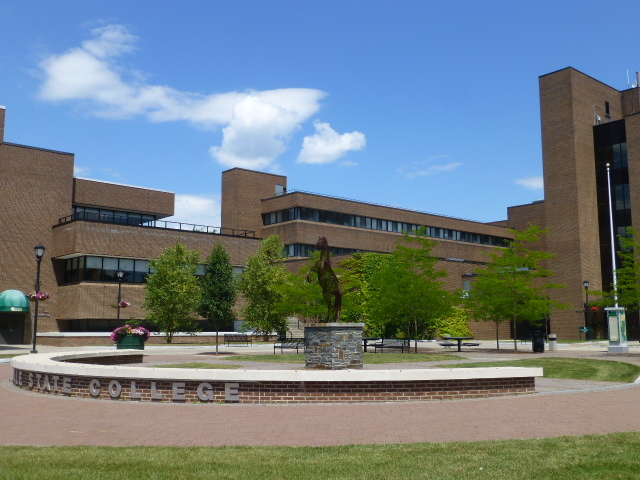 The university is instituting several new programs this year; Sustainability Studies, Zoo/Conservation Science, and Public Administration are new and unusual, and the Arts department allows students to concentrate in areas usually only found in much larger universities (Computer Art, Sculpture, and Printmaking). Several of the schools I visited in Ohio had some sort of claim to fame about being among the first to accept or educate women and/or blacks . . . Otterbein is no different. Their claim is that they opened their doors in 1847 and were the first to have equal graduation requirements for men and women. (Oberlin, on the other hand, was the first coeducational college in theory – meaning it took them several years to actually accept female students — as well as being the first to accept and graduate black students, but apparently they didn’t have the same requirements for the degree as the men did). Depending on their wording, I guess a lot of colleges can be the “first” to have done very similar things. Otterbein continues to lead the way in several regards. 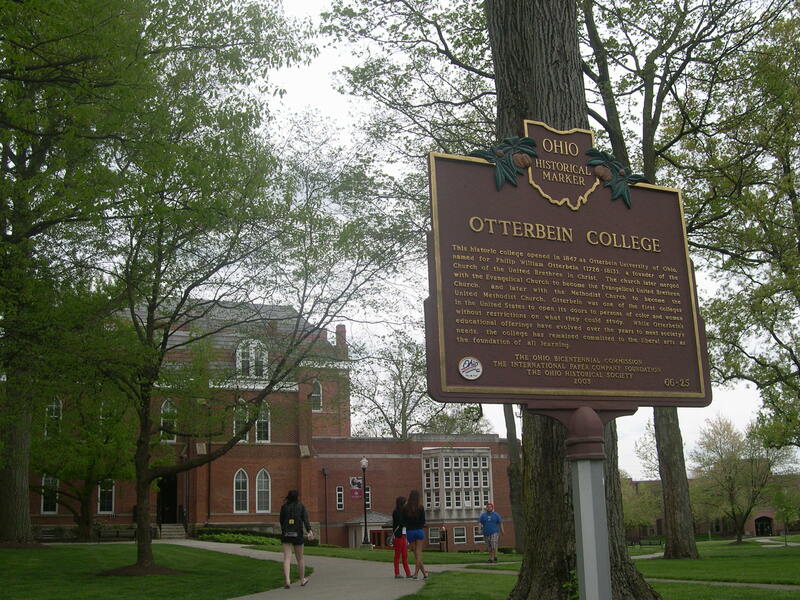 The Association of American Colleges and Universities awarded a large grant to Otterbein and four other colleges (including Tufts and Georgetown) to develop an integrative curriculum which will serve as models for other institutions. Students tend to be very happy at Otterbein; the university continues to earn high marks on the National Survey of Student Engagement. As is becoming more and more popular on campuses, they have a First Year Experience; I feel like it’s more uncommon to find a school without some sort of FYE. Otterbein has revamped their curriculum to address multidisciplinary perspectives and points of intersections. They have opened a new Living-Learning Community revolving around leadership. They are big on immersive learning (ie, travel tours) and experiential learning through internships, community service, global perspectives, and original research. They have switched over this year from quarters to semesters with an added 3-week January term to allow for more time and flexibility for immersion learning. In terms of applications, they work on a Rolling Admissions basis, providing answers in two to three weeks. They accept the Common App, and the transcript is one of the most highly weighted parts of the application. The average GPA of accepted students hovers around a 3.4-3.5 with ACT scores in the mid-20s. I enjoyed seeing Otterbein and learning more about the programs; it’s an attractive campus and they’re clearly putting effort into making the education worthwhile for the students. I was disappointed that their tour guides were not better trained; I heard from all the counselors (we were split into about 8 tour groups) that the tours were among the worst they had encountered. Most of the guides were freshmen, and while I think most of us had had good experiences with tours led by freshmen on other campuses, most of these students didn’t really seem to know what they were doing or how to answer questions. It can be very difficult to separate the experience on the tour from the quality of the school, so I hope this is fixed before it becomes a detriment for potential students and families visiting.